Carved in the Autumn of 1913. Mrs B. Mayor, by whom purchased at the 1914 exhibition, and by descent to Lady Rothschild, and by descent to the present owner. E. Pound, Gaudier Brzeska. A Memoir, London and New York, 1916, p. 161, no. 24, pl. 9, as A Faun, crouching. H.S. Ede, A Life of Gaudier-Brzeska, London, 1930, p. 198. H. Brodzky, Henri Gaudier-Brzeska, London, 1932, pp. 176, 182. R. Cole, Burning to Speak: The Life and Art of Henri Gaudier-Brzeska, Oxford, 1978, p. 100, no. 48, as 'Fawn Crouching'. E. Silber, Gaudier-Brzeska Life and Art, London, 1996, pp. 42, 98, 121, 130, 265, no. 62, pl. 80. London, Alpine Club Gallery, Grafton Group, January 1914, no. 47. London, Leicester Galleries, A Memorial Exhibition of the Work of Henri Gaudier-Brzeska, May - June 1918, no. 94. London, J. and E. Bumpus, Henri Gaudier-Brzeska. An Exhibition of Drawing and Statues, April - May 1931, no. 39. Birmingham, Museums and Art Gallery, on loan until 2007. The present work was carved by the artist during the Autumn of 1913, the year that Gaudier finally gave up employment as a translator at Wulfsberg & Co., timber importers in London's Docklands, to devote himself entirely to his art. During this period, he became an associate of the Omega Workshops at 33 Fitzroy Square, through his friendship with Nina Hamnett. This gave him an opportunity to show his work and to pick up commissions. 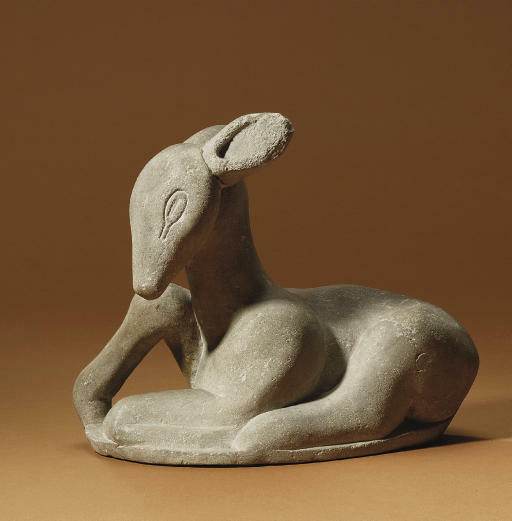 Crouching Fawn was one of six sculptures that he exhibited with other members of the group at the Grafton Group's January 1914 exhibition where his List of Works records that it was sold to Mrs B. Mayor of Campden Hill (a descendent of the present owner) for £15 with a 25 per cent commission due to Omega. Inspired by deer observed in Richmond Park, this carving evolved from his many animal drawings, some of which he described as being in the 'Chinese manner'. The artist delighted in drawing animals and was fascinated by their forms and movements, this naturally led to their regular appearance in his work. Amongst his sculpture, monkeys, cheetahs, cats, dogs, birds and fish are all present, and his drawings made at London Zoo feature even more exotic creatures, such as vultures, elephants, panthers, orang-outangs and storks. The present carving was exhibited in the 1918 Memorial Exhibition of the artist's work, following his untimely death in France in 1915, fighting in the First World War. During the exhibition, a woman struck the fawn on the ear with an umbrella, leaving a mark that it still bears today (see E. Silber, loc. cit.). Mrs B. Mayor, by whom purchased at the 1914 exhibition, and by descent to the present owner.